This post is somewhat embarrassing because it shows my complete lack of control when I really like something. Seriously I just buy almost an entire line…proof in this post as I currently own 8 out of 10. & it is killing me not to make it 10 out of 10. I have a problem. The Revlon PhotoReady Eye Art Lid + Line + Lash Duos come in 10 shades like I said above & each product is double-ended. Each duo comes with a cream eyeshadow on one side & a glitter on the other. The two colors I don’t have are Fuchsia Flash which is a very pale pink & fuchsia glitter & the other shade is Burnished Bling which I fully intend to pick up when I finally find it in stock! I posted a sneak peak of these on my Instagram here which is a good place to follow me for sneak peeks & deals I find! You can see I have some colorful shades & some more neutral ones- but they do have quite a few things in common! 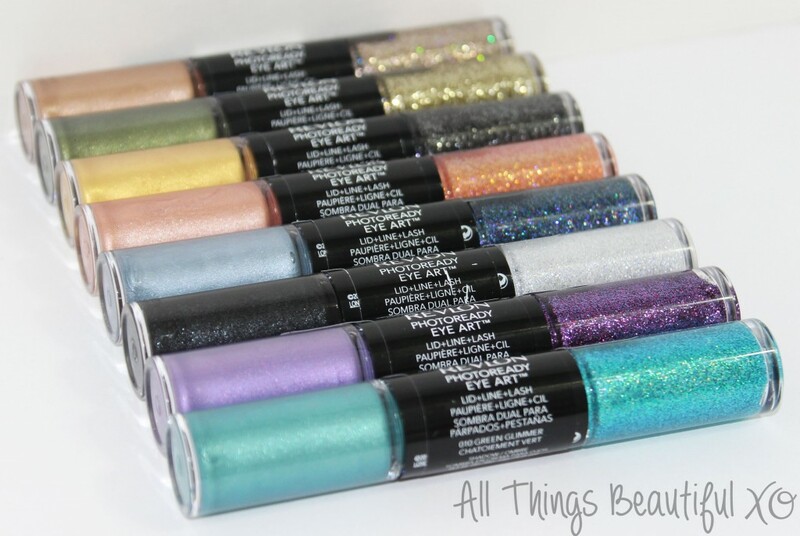 Each cream eyeshadow has a metallic glitter & each glitter is in a clear base overall. You can see the cream shadow side has a fluffy doefoot & the glitter side has an actual brush that comes to a tip. I think they both work well for application & I actually have found the cream eyeshadow to apply best straight from this applicator. 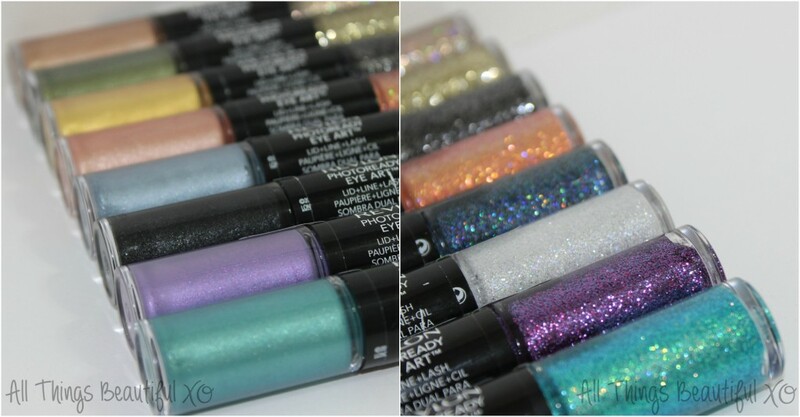 You can see Revlon really changed things up…despite these looking an awful lot like their nail polish duos! There isn’t a certain similarity on either side- some of them have a golden sheen, pure metallic, silver, etc. 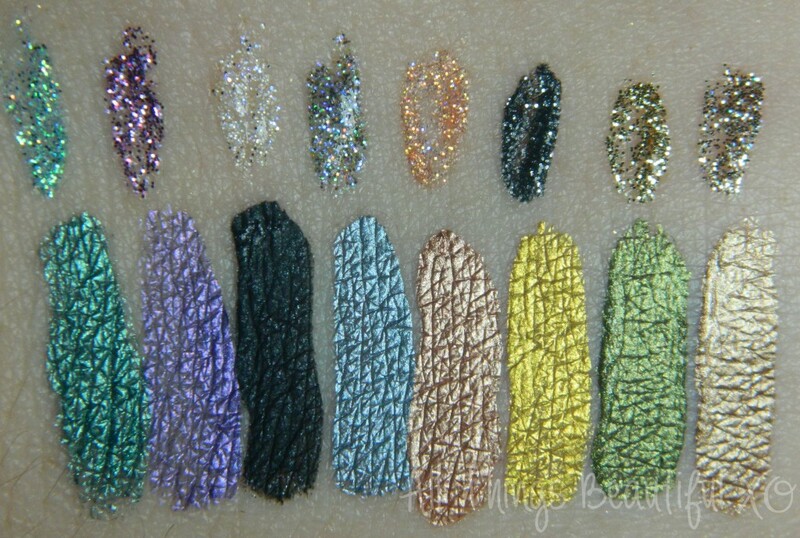 The glitter side is also quite different- some iridescent while others are a mixture of shades. They also have different opacity levels on both side. 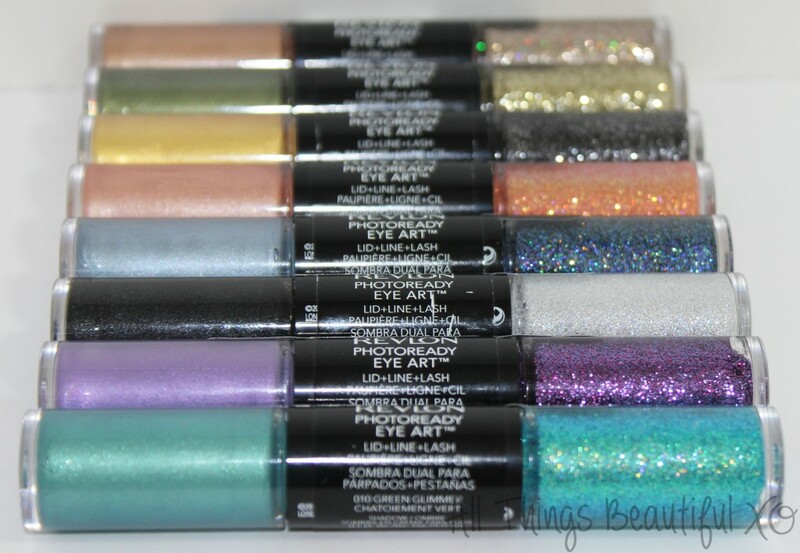 From left to right we have the Revlon PhotoReady Eye Art Lid + Line + Lash Duos in Green Glimmer, Lilac Luster, Black Brilliance, Cobalt Crystal, Peach Prism, Gold Glitz, Desert Dazzle, & Topaz Twinkle. I’m still developing favorites & such but so far many of my favorites…aren’t the duos. I like a glitter from here…a cream eyeshadow from over there…& so on. Green Glimmer is more of a mermaid turquoise with glow on one side that is a bit thin & iridescent + turquoise glitter on the other side. Lilac Luster also has that sheen to it but the texture is much thinner & the glitter side is a mix of purple & fuchsia. Black Brilliance is one of my favorites with a velvet looking black with a bit of silver softness & white, silver, + iridescent glitter on the other side which is a bit thin. Cobalt Crystal is a pale steel blue cream shadow with blue + iridescent glitter on the other side. Peach Prism is a gorgeous metallic peach & the other side is peach, gold, + iridescent glitter. I love this one. Gold Glitz has a glowy gold with a thinner texture & the glitter is a denser mix of black & silver which is super fun. Desert Dazzle is another favorite with a golden olive cream eyeshadow & muted gold-toned green glitter. The last shade is Topaz Twinkle which has a muted neutral cream eyeshadow & a stunning glitter duo with neutral glitter & holo glitters. I wanted to show a different angle as well since glitters throw light differently…as do metallic eyeshadows. I think they’re all pretty & usable. I prefer to use them over a primer & then I blend with a synthetic brush to blur any harsh edges. I was thinking of doing a tutorial…or a few using these duos because there are some cons. If you don’t let the eyeshadows dry before adding glitter they can seriously flake which is a total no-go for me. You really have to pay attention to drying between layers & not putting too much of either side in an area without blending. Yeah I should probably do a tutorial I’m guessing as I type all of this out. Any colors in particular? I honestly can’t remember the last drugstore cream eyeshadow I really liked that wasn’t in a pencil- likely the Maybelline Color Tattoos? …& the glitters? Well that has been a whole lot longer if ever. You can purchase the Revlon PhotoReady Eye Art Lid + Line + Lash Duos from Walgreens online right now but you should see them start to pop up at other stores like Target, Walmart, CVS, etc. soon. What shades appeal to you most? What are your favorite cream eyeshadows? Would you be interested in a tutorial using any of these shades? Milani Bella Eyes Full Eyeshadow Line Swatches & Review NEW Maybelline Fall 2012 Limited Edition 24 Hour Color Tattoo Swatches & Review! NEW Maybelline Color Tattoo Pure Pigments Eyeshadow Swatches & Review NEW Maybelline Color Tattoos Metal Collection Review & Swatches!